Due to technical difficulties and the burdens of exotic travel (to Beachwood, Ohio and Treasure Island, Florida), Scott and Tim are a day late with “Monday” Madness this week. Rest assured, it was recorded on Monday (we have some truth-in-advertising standards! ), so you can enjoy the full Monday “live” ambience. The episode is worth the wait though, as Tim reveals his plan to try to escape Lent Madness and Scott shows his love of exotic locations for video backdrops. Make sure you consider carefully how you vote in the Saintly Sixteen, because soon enough it will be time for the Elate Eight. Every (single) vote counts! 30 Comments to "“Monday” Madness — March 12-ish, 2018"
I wonder if the Trumpster expelled them both? Hope left voluntarily. Kelly’s secret clearance issues got McIntee today; Trump’s long reach got Tillerson. Stranger things have happened. Is there a way of verifying their location and safety? Reading from today’s matchup? Madness on Monday isn’t the same viewed on Tuesday. Can I be wait listed for Lent Madness University?? Will there be appropriate collegiate apparel (aka golden halo sweatshirts?) Keep up the good work men! Pity Party folks get you down. we all need to learn to go with the flow. Ah, Tim, leaving “3 nor’easters in a row” for Treasure Island, FL? Great timing! and a wonderful sabbatical to you. I thoroughly enjoyed mine a few years ago. I did not hear Tim’s plan to try to escape Lent madness! Did I nod off? Love, love Lent Madness! It gets me through each day with a smile. No questions for you, but wanted you to have some mail! Thanks! Tim and Scott: We CARE, We Care…do not be discouraged with lack of mail…it will probably arrive soon. Maybe after Lent? If a sweatshirt was offered, I might be tempted. Keep it up fellas! Really enjoy learning about new saints and of course, enjoy the voting. Sweatshirt Evangelism…maybe that idea could be raised at the Evangelism Matters Conference, March 15-17, right here in balmy Cleveland Ohio. Perhaps that explains the presence in Beachwood of 50% of the Supreme Executive Committee. You might visit the Rock and Roll Hall of Fame and see how the REAL Supremes have been immortalized….eat your heart out! Now I’ll stop in the name of love…. This is my first Lent Madness. It is so much fun and very educational! Thanks so much. Keep up the good work, and I can’t wait to read some of your other publications! Where are the missing Wall of Fame years? Inquiring minds want to know. Please investigate and let us know. Since you need viewer questions to respond to, here is a question that I have been burning to ask you for the last several seasons: What are the chances of getting the Mary Mags mug re-issued? Please, pretty please, pretty, pretty please? For that matter, how about offering a complete set of all of the Golden Halo winners? I am enjoying Lent Madness right along with March Madness. Saints and basketball!!! I have not filled out brackets. The stories about the people awe and inspire me. So do the basketball games. All are amazing!!! I have read more religious material and gotten on my treadmill more. Shalom! And another question (sorry) – now that we are into the Saintly 16, is it possible to have some sort of link or something to the previous information about the saints? I’d like to be able to go back and read the previous posts about each saint as the ‘madness’ increases. Maybe there is a way and I don’t know how? Could you figure out a way to do that, or explain a way? Thanks! Just click on the underlined words at the beginning of the post, for today it is Esther “made it past Lazarus” while Michael “got by Anna the Prophet”. Sweatshirt??? What about we folks here in the warmer climes of the coastal west —- Could we add a purple Lent Madness t-shirt to the order??? 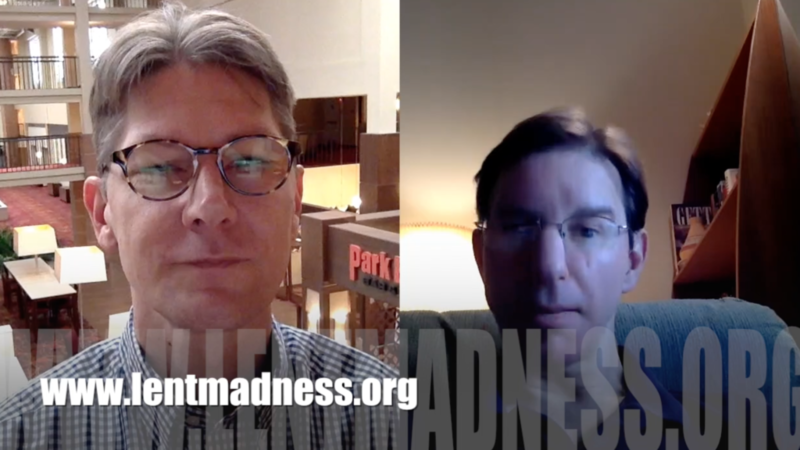 Have you thought about having a Lent Madness apt? Loving Lent Madness so much that I thought I would make a pilgrimage to Fr. Tim’s church and let him know in person when I am in the Boston area visiting family next week. Imagine my chagrin when I found out he would be on a sabbatical! Your congregation let you do that during Lent?! Wow! Thank you for the edifying experience that is Lent Madness. Oh, no! Yeah, taking a sabbatical for the first time in a decade. No sabbaticals from Lent Madness, of course. Next time!